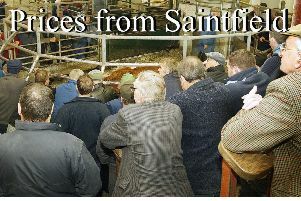 Trade remained strong in all rings at Enniskillen for around 1,000 cattle on offer. In the bullock ring light weighs sold from 200-240ppk paid for a 408kg Charolais at £980. Medium weights from 195-219ppk for a Charolais 530kg at £1,165 and heavier steers from 212ppk for a Charolais 634kg at £1,350. Enniskillen producer Charolais 536kg at £1,140, Charolais 530kg at £1,190, Aberdeen Angus 552kg at £1,170, Charolais 562kg at £1,195, Limousin 484kg at £1,100, Kesh producer Charolais 500kg at £1,135, Charolais 444kg at £1,035, Charolais 450kg at £1,000, 416kg Limousin at £995, Irvinestown producer Charolais 526kg at £1,120, Charolais 548kg Charolais at £1,155, Charolais 536kg at £1,080, Newtownbutler producer Charolais 540kg at £1,190, Charolais 582kg at £1,240, Charolais 532kg at £1,185, 550kg Charolais at £1,150, Rosslea producer 550kg Saler at £1,115, 560kg Saler at £1,090, 566kg Charolais at £1,185, 618kg Charolais at £1,275 and 600kg Limousin at £1,240. In the weanling ring steers and bulls sold from £670 to £1,085 paid for a 422kg Charolais while heifers ranged from £550 to £1,010 for a 415kg Charolais. Springfield producer 422kg Charolais steer at £1,005, 415kg Charolais steer at £1,060, 378kg Charolais steer at £1,000, 400kg Charolais steer at £1,055, Enniskillen producer 420k Charolais steer at £925, 425kg Charolais bull at £900, 345kg Charolais bull at £855, 320kg Charolais bull at £820, 482kg Charolais steer at £1,085, 375kg Charolais steer at £880, 365kg Charolais heifer at £910, 395kg Charolais bull at £890, Derrygonnelly producer 392kg Limousin bull at £870, 402kg Limousin bull at £855, Letterbreen producer 360kg Blonde d’Aquitaine heifer at £820,314kg Blonde d’Aquitaine bull at £880,317kg Blonde d’Aquitaine heifer at £765, 324kg Blonde d’Aquitaine heifer at £750, 366kg Charolais heifer at £770, 370kg Charolais heifer at £860,412kg Charolais heifer at £840, Kesh producer 340kg Charolais heifer at £780, 290kg Charolais heifer at £705, 250kg Charolais heifer at £620, 318kg Charolais bull at £875, 272kg Charolais heifer at £715, 290kg Charolais bull at £800, Dromore producer 325kg Charolais heifer at £770, 306kg Charolais heifer at £690, 360kg Limousin heifer at £800, 415kg Charolais heifer at £1,010 and Garrison producer 241kg Charolais heifer at £660, 250kg Charolais heifer at £670, 299kg Charolais heifer at £875, 228kg Charolais heifer at £590, 339kg Charolais bull at £820. Tamalght producer Belgian Blue bull at £345, Belgian Blue bull at £315, Lisbellaw producer Limousin bull at £320, Derrygonnelly producer Simmental bull at £360, Friesian bull at £190, Friesian bull at £115, Tempo producer Shorthorn beef bull at £435, Drumcose producer Hereford bull at £270, Hereford bull at £240 and Enniskillen producer Aberdeen Angus bull at £225, Aberdeen Angus bull at £270. Derrygonnelly producer Aberdeen Angus cow and heifer at £1,480, Aberdeen Angus cow and heifer at £1,300, Irvinestown producer Hereford springer at £1,300 and Garrison producer Limousin cow and heifer at £1,150. Forward lots sold to 217ppk paid for a 640kg Charolais at £1,390 and a top of at £1,400, medium and light weights sold from 192-225ppk paid for a 470kg Charolais at £1,060. Beef lots sold to 185ppk paid for a 666kg Charolais at £1,230, light weights sold from 120-208ppk paid for 498kg Charolais at £1,035. Ederney producer Charolais 880kg at £1,300, Charolais 600kg at £1,170, Leggs producer Charolais 790kg at £1,180, Florencecourt producer Charolais 666k at £1,230, Lisnaskea producer Charolais 578kg at £1,050, Letterbreen producer Charolais 690kg at £1,095 and Ederney producer Charolais 60kg at £1,180.